WTF: What's Wrong With Cambridge's Wrong-Way Bridge? 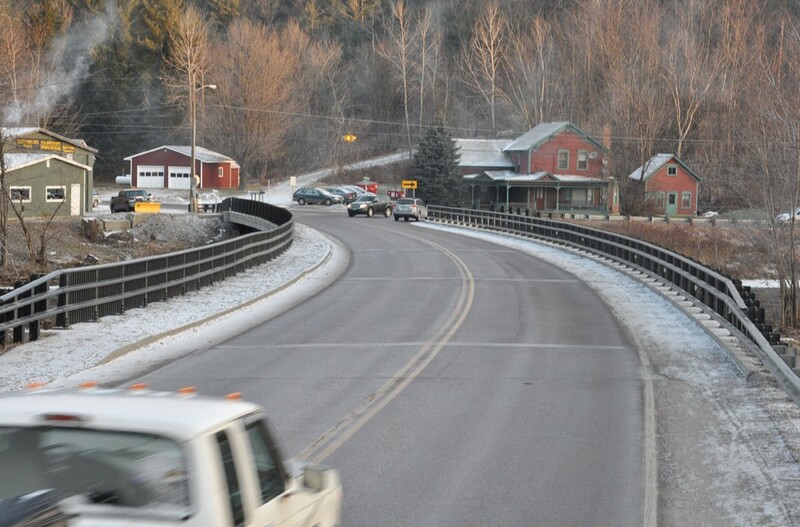 Hours before the end of 2014, a fatal highway accident refocused attention on a notorious section of Vermont Route 15 in Cambridge. The December 30 accident, in which a car plunged into the icy Lamoille River, occurred just a few hundred yards from the "Wrong-Way Bridge," a nickname used even by local journalists and police officers. So WTF, exactly, is wrong with the Wrong-Way Bridge? It's not that traffic on the bridge is rerouted to the British side of the road, or that, on an eastbound crossing, drivers are magically redirected to the west. The bridge has no such powers. Rather, at the bridge, Route 15 bends so as to seem to steer drivers "the wrong way" — toward Fletcher — rather than along the more direct east-west route the road seems to "want" to go. That apparent bit of misdirection has caused no end of consternation to local drivers — and invited several theories on the reasons for this orientation. One persistent rumor is that the bridge was assembled incorrectly. Joseph C. Nelson's 1997 book Spanning Time: Vermont's Covered Bridges refutes this legend, which holds that the road was reoriented to accommodate improperly manufactured bridge girders. The book also refers to an equally unlikely theory: The road bends oddly because the supervisor of highways at the time lived in the northwestern city of St. Albans. On a map, nothing about the bridge looks out of the ordinary. 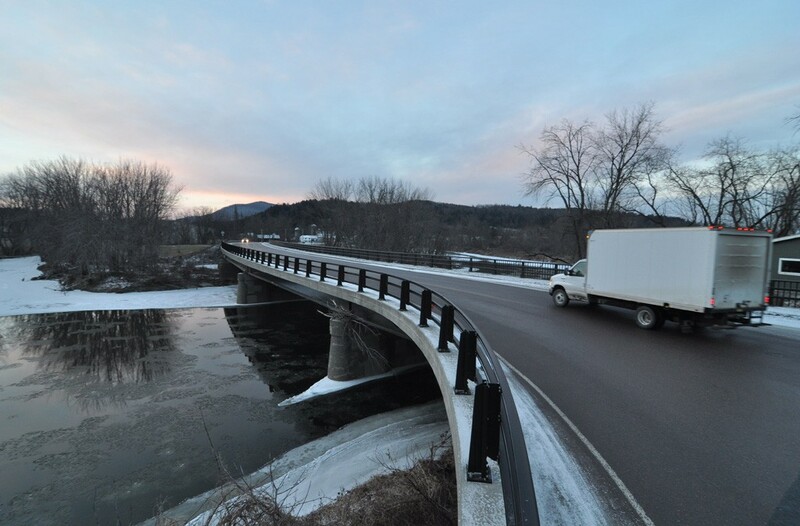 Route 15 runs from Winooski to Danville, so it had to cross the Lamoille River somewhere. Take a look at the bridge on Google Maps (44°38'52"N and 72°52'21"W), and you'll likely conclude that a site about a third of a mile east, just over the Jeffersonville town line, looks like a more suitable bridge location. Had a span been constructed there instead, Route 15 would not have had to bend once to the north and again to the south to continue on its east-west path. Or so it appears. But maps don't tell the whole story. From the 19th century until the middle of the 20th, this particular confluence of rivers sported two covered bridges. The Gates Farm Covered Bridge, also known as the Little Bridge, was built in 1897 to span the narrow Seymour River. The Cambridge Village Bridge (aka the Big Bridge), a relatively rare two-laner built in 1845, once stretched across the wider Lamoille. By 1950, both were relocated in preparation for the highway bridge that would supplant them. The Gates was trucked to a nearby field; the larger Village Bridge was installed at the Shelburne Museum. The course of the Seymour River was also altered so that it would empty into the Lamoille upstream of the new bridge. The site for the new 400-foot steel-and-concrete bridge had proved itself a good location for crossing a river or two, but that wasn't the only reason it was chosen. In an email, J.B. McCarthy of Vermont's Agency of Transportation relates his recent conversation with Warren Tripp, a VTrans bridge engineer in the early 1960s. Tripp recollected that the bridge's intended purpose was to shunt drivers onto Pumpkin Harbor Road, which leads to the town of Fletcher, about five miles to the northwest. A planned extension of Route 15 would have connected Cambridge and Jeffersonville along the south side of the Lamoille River. Here lies the source of the nickname. The bridge bends to connect with a spur that was ultimately never built. The Wrong-Way Bridge presents a number of driving hazards, most obviously the nearly right-angle turn required to cross it. The bend limits visibility, and requires a sudden and often unexpected decrease in speed. The only warning for drivers comes from a somewhat ambiguous blinking yellow light. Justin Marsh, 25, is a Cambridge resident and a member of the board of directors of the Cambridge Historical Society. He's also the grandson of Roberta Marsh, author of the book Cambridge, Vermont: Special Places, Special People. When the phrase "Wrong-Way Bridge" showed up in recent headlines, Justin Marsh was inspired to do some digging. This never-named bridge underwent extensive repairs about five years ago, says Marsh. "You would think that if they were going to do a massive overhaul on that bridge ... that they would have done it the way it had been intended, but they didn't," he says. "It would have been the opportune time to put in either a light or a turning lane, but that never happened." A 1981 Burlington Free Press article refers to another danger, a side effect of the bridge's design. The driver in a near-fatal motorcycle accident placed the blame for his spill on the buildup of oil on the bridge's surface. According to the article, the bridge's surface is often slicked with oil, a condition that arises from "trucks leaning into the curve" and discharging slippery effluents in larger-than-normal quantities. In fact, though, the most serious hazard represented by the bridge has nothing to do with its design. Situated as it is at the base of Bartlett Hill and astride the Lamoille River, the bridge is often on the receiving end of floodwaters rushing downhill. Marsh says that the river floods "several times a year" near the bridge, as a result of springtime snowmelt or summer's heavy rains. When high waters render the bridge impassable, traffic must be rerouted, and media reports often refer to a road closure "at the Wrong-Way Bridge." Marsh speculates that it's precisely this usage that has guaranteed the persistence of the nickname. The Wrong-Way Bridge does not head in the wrong way, but a case could be made for its having been built in the wrong place.